With the trading deadline now one week in the rear-view mirror, it is much too early to truly understand that impact that the players will have on pennant races. The Toronto Blue Jays went from among a crowd of American Wild Card contenders to favorites for the Wild Card with a potential chance to catch the Yankees. Teams like the Houston Astros, New York Mets, and Kansas City Royals all made significant additions to help them in their chase to the playoffs and potential success once October arrives. It is not too early, however, to discuss the impact on payroll that those changes have had on the dealing teams. The Blue Jays have made the biggest moves of the season, but those moves did not have the biggest impact on payroll. Contenders like the Pittsburgh Pirates, New York Mets, and Houston Astros made multiple moves that had an even greater effect on their payrolls while sellers like the Milwaukee Brewers and Detroit Tigers made moves that cleared significant space on the payroll. Of the 30 Major League Baseball teams, only the Arizona Diamondbacks refused participate. More than 100 players changed teams at the deadline. Considering only those players making more than close to the major league minimum salary, nearly $100 million in 2015 rest of the season salary was moved at the end of July. The graph below took into account every single move made near the trading deadline where more than a minimum salary was added to the payroll. Focusing first only on additions made to payroll without considering subtractions, the Blue Jays do take the top spot. Data from Cot’s Contracts. Adding Troy Tulowitzki and David Price made a significant difference for the Blue Jays. The Pirates and Mets made a series of smaller moves while the non-contending Colorado Rockies and perhaps non-contending Texas Rangers added Jose Reyes and Cole Hamels, respectively, to the roster in 2015. Of the contenders, the Nationals added the smallest amount with the Philadelphia Phillies agreeing to pay for almost all of Jonathan Pabelbon’s salary in 2015 although the Nationals guaranteed him $11 million in 2016 by guaranteeing almost all of Papelbon’s vesting option at the time of the trade. The Yankees, Cubs, and Orioles all made smaller moves that did not affect payroll very much this season. 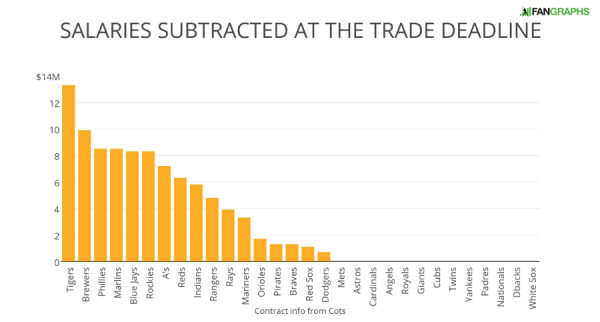 All the salaries added above had to come from somewhere, and the graph below shows salaries subtracted in moves at the trade deadline. The Detroit Tigers, in moving David Price, Yoenis Cespedes, and Joakim Soria unloaded the most as the team transitions from Dave Dombrowski to Al Avila. The Tigers made out pretty well at the deadline considering the prospect haul included multiple present and future members of the rotation all at a decreased cost. The Brewers did not have quite as much to sell in terms of salary, but getting rid of Gerardo Parra, Carlos Gomez, and most of Jonathan Broxton’s salary saved them around $10 million the rest of the season alone. The Phillies did what they needed to do to rebuild and the Miami Marlins operated exactly as one would expect the Miami Marlins to operate. 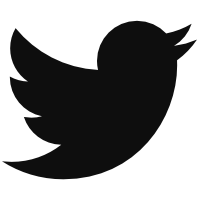 The Dodgers presented an interest case when preparing this information. They do not appear to have added or removed much payroll, but money was a major factor in their moves. They agreed to take on Mat Latos as well as Mike Morse with the Marlins paying an undisclosed amount of money. Then, the Dodgers moved Morse, and reportedly $7.5 million, to the Pittsburgh Pirates. For the purposes of the charts above, the full salary for Morse in 2015 went to the Pirates this season, and the money for Morse on the Pirates was considered a payoff for his 2016 salary. Also not factoring in the Dodgers moves was the nearly $30 million in bonus money that the Dodgers paid for Hector Olivera. The salary for Olivera is just $2 million this season with just over $30 million owed for the next five years. Without eating the bonus money, the Dodgers might not have been able to make moves in the same way. Taking the two graphs above together, we can see the total affect on 2015 payroll from the moves at this year’s deadline. Surprise! 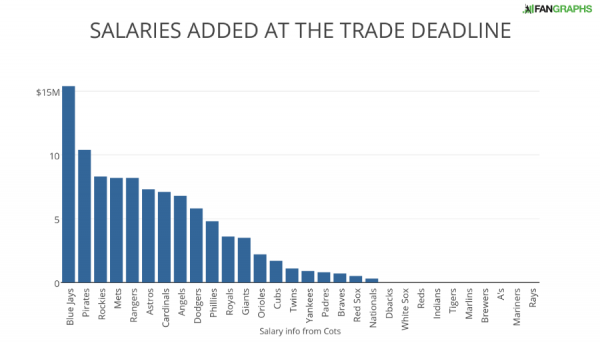 The Pirates, Mets, and Astros, three teams that average under $100 million payrolls and all rank in the bottom third in terms of salaries were the biggest movers at the deadline. While the Pirates move does include $2.5 million for Michael Morse this season (as noted above), they would still be among the biggest increases without him. The team added JA Happ, Joakim Soria, and Aramis Ramirez in three under-the radar moves, but their ability to take on salary helped add needed depth for a team in excellent position to make the playoffs. While the Mets deadline was not without considerable controversy, and they did well to improve the team, it probably should be noted that the payroll increases could very well lineup with the extra wiggle room provided by the suspension of Jennry Mejia and the insurance for David Wright. The payroll movements were not limited to 2015 alone. The Rockies jettisoned a considerable amount of future payroll in the Troy Tulowitzki deal and took on just some of that obligation in the rest of Jose Reyes’ contract. The Phllies took on Matt Harrison‘s contract and $26 million in future obligations while also paying for $9.5 million of Cole Hamels’ $81 million owed to him. Considering Olivera’s salary, the Dodgers actually removed more future obligations than they took on, although Alex Wood’s salary will rise as he increases his experience in the majors. The trade deadline saw an incredible number of big-name players move teams and while paying just two months of a season’s salary might not seem like a large amount, these trades will have a significant on 2015 payroll. 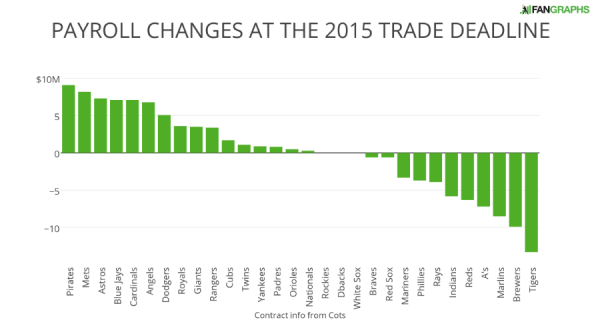 We hoped you liked reading Payroll Changes at the 2015 Trade Deadline by Craig Edwards! What Can The Nationals Do? And with that Swisher/Bourn/Johnson trade, this immediately became outdated. I didn’t really understand the MLBTR blurb about creating roster flexibility vs. creating payroll flexibility in different years. It seemed to ignore the time value of money plus the ability to release the player. But S/B/J trade was not “at the deadline”, so doesn’t count.